Check out this great giveaway for a new iPhone 5S. If you are anything like me, screen protectors can save your phone from lots if mishaps, especially if you have children. Just Glam Screens are great and can extend the life of your smartphone. If you can’t afford the new phone, like me, here is a great opportunity for you to win a new iPhone 5S and a years supply if screen protectors. CLICK HERE and enter your name and email for a chance to win. If you tweet and share on Facebook, you will be eligible for additional entries. Good Luck to all who enter. Today’s deals are for Macworld Magazine and Martha Stewart Living Magazine. Stay on top of today’s fast-changing Apple technology with Macworld magazine! Macworld is the ultimate resource for savvy users of Apple products. Every issue is filled with authoritative news, analysis, and tips about all things Apple — Mac, iPhone, iPad, and beyond! Best of all, Macworld brings you the most trusted product reviews, from Apple hardware to accessories to the very best apps. Make the most of your iPhone. Get work done on your iPad. Shoot videos with pizzazz. Print gorgeous digital photos. Make the most of your Apple products with Macworld! Martha Stewart Living is for discerning, quality-conscious readers. It celebrates the simple things people do in their everyday lives: gardening, entertaining, renovating, cooking, collecting and creating. We encourage our readers to dream, then show them how to realize their dreams. Get Free Shipping on Any Order (No Minimum) at DiscountMags.com! Amazing Magazine Subscriptions with No Sales Tax at DiscountMags.com! You must sign up through my referral link for the offer to apply. The JBL OnStage IIIP loudspeaker dock combines many proprietary technologies to provide the highest-quality sound, astonishing bass, and clear and accurate audio from any direction. With the help of the IR remote, you can take complete control of your music with the JBL OnStage IIIP loudspeaker dock. 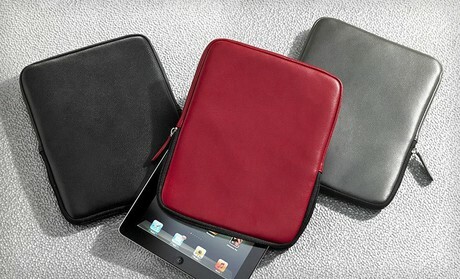 The sleeve safeguards iPads against scratches and dents with a stylish outer shell made of genuine, full-grain leather. Supplementing its protective exterior, the case features a padded, neoprene interior designed to offer further protection against damage. A nylon zip closure keeps Apple’s popular tablet from accidentally sliding out of the case when you’re carrying it around or playing games of ultimate iPad frisbee. 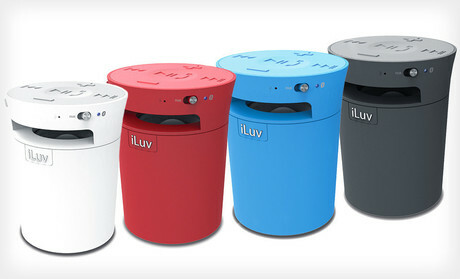 Featuring a cylindrical, splash-resistant design, the iLuv MobiCup is capable of turning a cup holder into a Bluetooth speaker and speakerphone that can withstand the elements. Sealed, top-mounted controls—including play/pause and volume—let users customize audio playback, and a hands-free speakerphone feature lets passersby chime in on phone conversations about uses for excess holiday fruitcakes. As a completely wireless device, the MobiCup draws power from a rechargeable lithium-ion battery that can provide hours of play time. Features a hard shell exterior and a scratch-resistant lining. 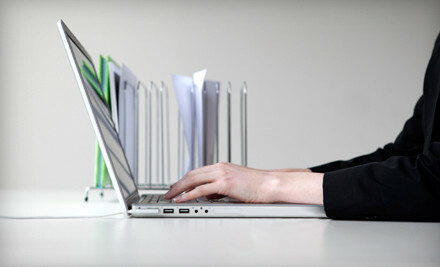 Converts into a stand for hands-free viewing of videos, e-books and more. Please take a moment and visit our sponsors: Coupon Pro and Penny Auctions Canada! Coupon Pro is your daily money-saving blog for the hottest freebies and coupons from top brands. We want to help you save the most on everyday items your family needs. 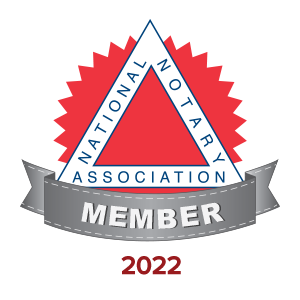 Join us today! The iPad Mini has a beautiful display, powerful A5 chip, FaceTime HD camera, iSight camera with 1080p HD video recording, ultrafast wireless, and over 275,000 apps ready to download from the App Store. The iPad mini is an iPad in every way, shape, and slightly smaller form. Easy for on the go with that same great Apple power punch! The Kensington KeyFolio(TM) Pro 2 provides a high-performance removable keyboard optimized for the touch typist. Built-in Bluetooth technology delivers wireless operation and one button set-up. A secured Velcro fastener ensures tablet vertical stability with viewing angels from 70 to 20 degrees. This lightweight 3-in-1 design is optimized for travel and in-case use plus protects your iPad 2 from wear and scratches. 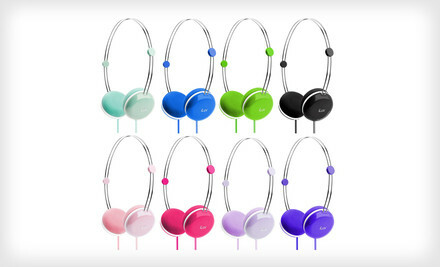 $12 for iLuv Sweet Cotton Headphones ($59.99 List Price). Eight Colors Available. Free Returns. These stylish headphones complement the full sound emitted from their padded ear pads with a slew of built-in digital controls. A SpeakEZ remote works seamlessly with iPhones, iPods, and iPads to control playback and volume. The remote’s integrated microphone even lets you use voice commands, answer phone calls, and record yourself freestyle rapping in your sleep. Find Today’s Daily Deal and more on the Best in New York! 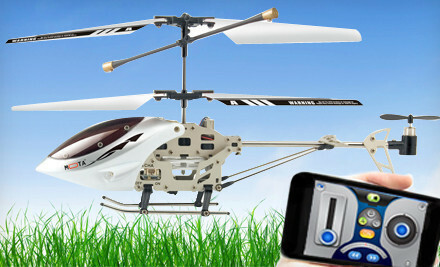 $29 for a Mota iPhone-Controlled Helicopter ($129.99 List Price). Free Shipping. The Mota helicopter loftily slices through tropospheric air, hovering and maneuvering at the command of its iPhone, iPad, or iPod Touch owner. From a distance of up to 20 feet, pilots control their chopper via a free app. The app allows operators to choose between using their device’s touchscreen or accelerometer to dictate the helicopter’s flight path. The mechanical bird arrives fully charged and recharges via USB. First-time users only need to download the free app and mail a thank-you card to the Wright Brothers before taking to the skies. Find Today’s Daily Deal on the Best in New York! 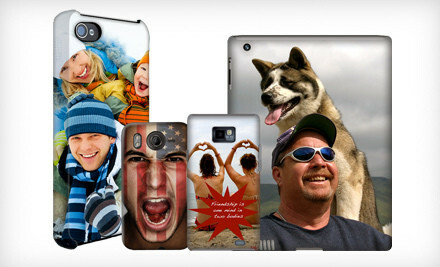 Customizable Phone and Tablet Cases from Frydaze (Up to 52% Off). Free Shipping. Multiple Sizes Available. Frydaze’s online design software lets users choose from predesigned case art, including striking photographs, fun, colorful patterns, and fMRIs of Alexander Graham Bell’s brain. Users may also start from scratch, uploading their own photos onto case templates before tweaking the template by adjusting color and adding text or objects. Phone and tablet cases fit over 60 models from brands such as iPhone, Blackberry, HTC, iPad, Kindle, and Samsung Galaxy. It’s important to understand computers for the same reason it used to be important to understand tall people: they run the world. Get a working knowledge with this Groupon. This Groupon is valid for any class adorned with the Tekserve Academy shield logo listed on the schedule. Each month, 18 classes are available six days a week; dates and times vary. Some examples of the classes offered are Apps for Productivity, iMovie Basics, Syncing with iCloud, and Intro to Twitter. While classes are available for PC-computer users, they are geared toward Apple computer and tech-related products. Six long shelves holding vintage radios and projectors fill the length of an exposed-brick wall. Old Mac computers face out from knee-high cabinets and a few hang from the ceiling and display “now serving” numbers reminiscent of a delicatessen. From the looks of it, you might think you’re in a tech time warp—but it’s quite the opposite. The antique electronics simply and aesthetically remind customers of the technological past when they’re inside Tekserve, an authorized reseller and service provider for Apple products. For more than 20 years, its staff of computer gurus has been fixing Apple products during repair and consulting services and shedding light on the products’ capabilities during classes and seminars. These informative sessions touch on an evolving list of topics that often includes improving one’s social-media experience and building one’s own Internet. The shop also has an array of gadgets and accessories available for purchase or rental. 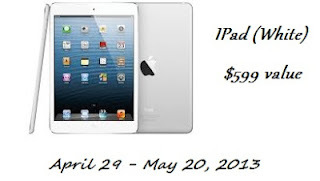 Coupons.com is giving away an iPad® EVERY DAY for SEVEN DAYS! There is still time to enter, and these make awesome gifts fr kids going to college or high school . Gear4 Angry Birds iPhone, iPod Touch, and iPad Cases (Up to 76% Off). Multiple Styles Available. Almost instantly after its launch in 2009, the Angry Birds mobile game became a global phenomenon, catapulting its cantankerous avian heroes to celebrity status. Now, the whimsical creatures can flap and dive-bomb across phones’ front and back. Gear4’s durable cases are custom-fitted for Apple mobile devices. Though slim, the hard plastic design protects gadgets from scratches, dents, and strict helmet driving laws. $9 for an Angry Birds iPod Touch case ($29.99 list price). Available designs: Black Bomber, Green Pig, and Red Bird. $9 for an Angry Birds iPhone 4/4S cases ($29.99 list price). Available designs: Green Pig, Red Bird, and Yellow Bird. 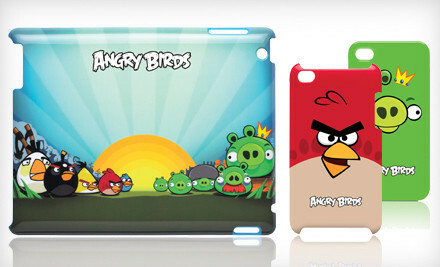 $12 for an Angry Birds iPad 2 case ($49.99 list price). Available designs: Family, Pig King vs. Red Bird, and Red Bird. An additional $3 shipping fee will be charged at checkout. 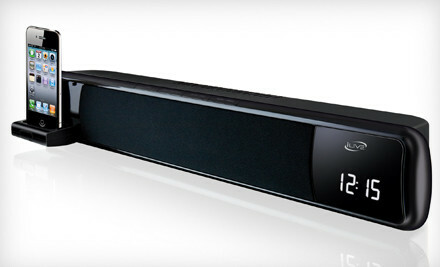 $39 for an iLive 20-Inch Sound Bar for iPod and iPhone ($69.99 List Price). Free Shipping. The sleek 20-inch horizontal speaker blasts dynamic two-channel stereo audio while taking up minimal space on bookshelves or the head of a finishing-school graduate. The combination speaker, dock, and FM radio liberates songs and podcasts caged within iPods and iPhones, freeing them to romp around every corner of the room. It also connects to TVs, DVD players, and computers, as well as other devices, and includes a remote control for stealth station changing. The Hype aluminum Bluetooth keyboard stand for the iPad 2 and the New iPad reminds touchscreen users of the satisfying sensations and sounds of clacking keyboard keys. The multipurpose keyboard can transmit phrases up to 30 feet away from your iPad thanks to Bluetooth V 2.0 technology. A built-in stand supports horizontal or vertical viewing, and the keyboard itself doubles as a protective case when the iPad’s digital eyes grow heavy with fatigue. 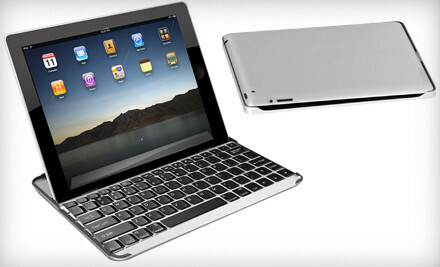 For $19, you get a Hype HY-1023-BT aluminum Bluetooth keyboard stand and case for iPad 2 and the New iPad (a $49.99 value). An additional $5 shipping fee will be charged at checkout. Computers often experience breakdowns in the stressful moments leading up to virus scans, deleting important files and renaming corrupted documents “nothing to see here.doc.” Cure digital ills with this Groupon. 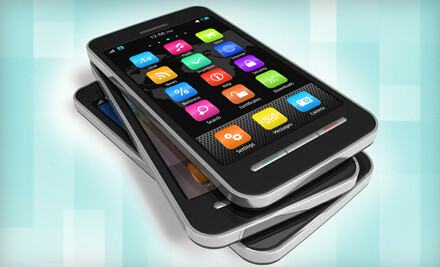 Trained technicians repair computers, tablets, and smartphones, replacing iPhone 4 LCD screens ($99.95), iPhone 4S cameras ($79.95), and iPhone 3 batteries ($59.95). To minimize the amount of time customers and their electronic devices must be apart, the staff at iFix New York work fast, diagnosing digital hiccups for free while patrons wait. Once repairs are approved the technicians begin tinkering with devices, generally finishing their work within 24 hours when they have the needed parts on hand. Clients can monitor the progress of repairs on their computer, smartphone, or audio equipment with an online tracking system. Technicians can also perform services onsite, setting up homes, small businesses, or state-of-the-art treehouses with wireless or printer networks.